It is our sense of purpose and culture of values that enable us to share with you the highest quality standards in all that we do: from the farms to the beans to your chocolate. We aim to have an impact by bringing happiness through pure luxury to our customers and prosperity to our farmers. It comes to you in each delicious bite and you can feel good knowing you are enjoying a purposeful and sustainable luxury product with a positive impact. 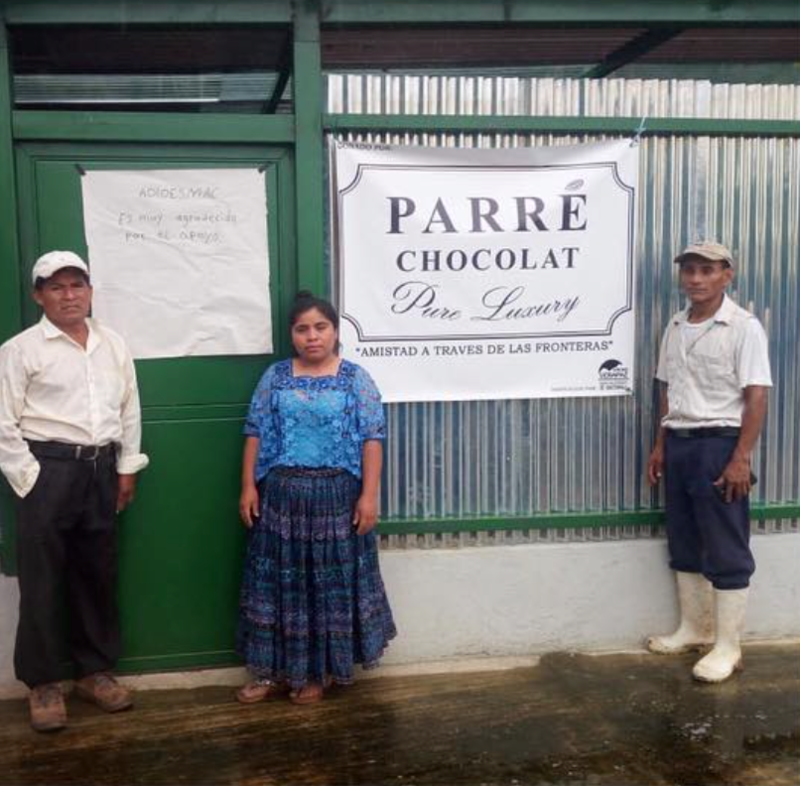 Parré Chocolat's business model benefits farmers and their families. We are dedicated to enhancing the lives of all those involved in making our chocolate through the responsible management of our supply chain. At Parré Chocolat, we create our chocolate ourselves in our facility using artisanal methods and personal values. We build long-term relationships across the supply chain to create stability and success for all. Through our partnership with Uncommon Cacao, the world's leading specialist in transparent trade, we work with trusted farmers to source the highest quality of beans under high standards of human rights. We pay a premium price to the farmers and have pure, ethical trade practices, which, in turn, directly help them provide for their families and improve their communities. We do our best to commit to purchasing into the future, in order to ensure a steady income for the farmers and their families. At Parré Chocolat, we are committed to sourcing only high-quality "Fine Flavor," 'Fino de Aroma" cacao beans with integrity. "Fine Flavor" beans represent only 6% of all chocolate. We value traceability and the importance of knowing the origin of our beans from the moment a pod is cut from the tree and throughout their journey to and into your chocolate. That's why, to start with, our beans are only sourced from countries where cacao originated centuries ago. One of our partners is Uncommon Cacao, the leading global supplier dedicated to transparency and farmer community support. We only source quality cacao from producers we trust. We build long-term relationships across the supply chain to create stability and success for all. We also strongly believe in investing in the local communities in which we operate through local hiring, premium price payment to farmers, and training and development at the farms from where we buy our beans. We believe fine chocolate starts with responsibly sourcing high-quality raw cacao beans and continues through the creation of the final piece of chocolate. We source our beans directly from farms we know. We are devoted to better understanding the social and economic impact of the sourcing and processing of cacao so that we can create positive change along the supply chain, all the way from the farm to our customers. Our company is only as strong as our team and at Parré Chocolat, we prioritize building and nurturing a culture of excellence across our operations. From the farmers who handle the harvest and post-harvest process of their cacao, the employees of our partner Uncommon Cacao who provide the second sorting and quality control at the Uncommon facility, to our team of chocolate making experts at our facility in Fair Lawn, we are proud of our team and know that they share our collective values of respect, inclusiveness, excellence and responsibility. We value diversity and inclusion because we believe each of our employees can make a unique contribution to our company and the Parré brand. We recognize each individual's knowledge and skills as an important source of organizational capability and competitive advantage and do our best that they receive the support they need to maximize their potential. At Parré Chocolat, we strongly believe that a successful company has a responsibility to the greater community. Our founders have a long history of charitable giving and have begun this organization to bring happiness to others. We are proud of our donations toward supporting nonprofit organizations in the Adiosemac and Chivite communities where we work. In 2018, we donated to provide post-harvest facilities in communi-ties and have funded tool purchases for farmers in Guatemala to help them provide for their families in a more sustainable and efficient manner. The Parré team is involved in hands-on volunteerism in the local community. Our employees enjoy the benefits of doubling their impact through our employee matching program for charitable donations and a paid day for volunteering. In addition to benefitting people and communities through our business operations, were supporting the local communities in which we operate through our giving programs. As we continue to expand our business, we plan to expand our partnerships with charitable organizations as well.